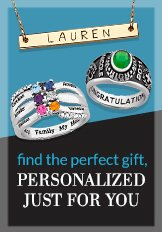 Find unique, personalized and customizable jewelry for Mom. Our personalized Mothers Jewelry is a meaningful and keepsake way to celebrate Mother's Day, a birthday or even holiday occasion such as Christmas. Our jewelry is trendy, stylish and current for today's Moms, Grandmothers, Nana's, Gigi's... Whether personalizing with birthstones or engraving names, our jewelry is a gift from the heart.